How come musicians with some sort of jazz inklings, whether its training or love, make great pop records? I'm thinking of Joni Mitchell, Norah Jones, Steely Dan, those kinds. Man, they make some great singles at times. Free Man In Paris, Josie, Don't Know Why, you put their chops into three minutes, and they can be so memorable and rich. I think it's because these artists have a sophisticated knowledge of melody and composition, they know more chords, and how different instruments combine in arrangements. I bring this up because Cape Breton's Mackinnon has a jazz studies background, and you certainly hear it all through her confident, intricate debut album, Where The Days Went. The melodies, the phrasing, the instruments used, it may be popular vocal music, but it's so much more involved than songs based around three chords. NOT THAT THERE'S ANYTHING WRONG WITH THAT! There's room for it all in your listening, but when a singer as pleasurable as Mackinnon swoops up instead of down, hitting a surprise note, creating a new and unexpected line, well that's just the kind of moment I love. 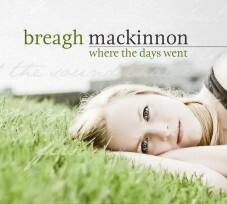 Mackinnon's debut sees her already in control of a sound for her thoughtful words and gorgeous melody lines. Co-producing with engineer Mike Shepherd, her voice soars above each track, as a grand bed of piano, acoustic guitar, stand-up bass, strings, brass, and sweeteners such as mandolin and fiddle compliment her singing. Wisely, she's the lead instrument through it all. The songs are bright, but tinged with melancholy. Long ago "blue notes" were identified, bending a note slightly lower to create that bluesy feeling. Is there a melancholy equivalent? Uplifting music with a sad tinge? I'm no composer, but Mackinnon's picking the right sounds. Album opener Harbourtown comes in shining, a harmony chorus of ooh's, a gently-picked mandolin (say hi to Breagh mentor Gordie Sampson), and a great twist on the Maritime hometown number: "I don't know what love is in this harbour town/that's what six years in Alberta does to you." In My Heart, she has some great observational lyrics, new lines on classic subjects: "My heart, it pounds before it breaks...I like that beat, and the sound that it makes/a warning sign you were my first mistake." On White Picket Love, a nasty break-up song, she chides an unfaithful love with blowing what could have been a white picket fence, two kids and a dog, 25-year relationship: "While you were messing around, I was trying hard not to mess up/I guess my white picket love was never enough." But don't come away with the idea this is sad stuff; there are so many great licks and moments, uptempo grooves, and some happy lyrics along the way as well. Catch her if you can: Mackinnon's launching the album in Fredericton this weekend, with a show Saturday night at the Cedar Tree Cafe. And a special bonus, the ever-excellent Babette Hayward opens.